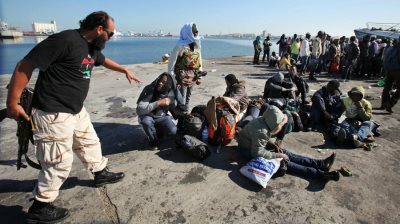 Africans and Black Libyans are fleeing NATO-backed terrorists in Libya and the EU wants to return them..
AFRICANGLOBE – European Union leaders have agreed on a controversial plan to help stem the flow of African migrants from Libya this spring. At a summit in Malta, the bloc’s leaders on Friday decided to give 200m euro ($215m) to Libya’s fragile government to step up efforts to stop migrant boats in the country’s territorial waters. Under the plan, the EU will also provide support for the setting up of “safe” refugee camps in Libya and the voluntary repatriation of refugees willing to return to their countries of origin. It will also boost training and equipment to Libya’s struggling coastguard and get more involved with neighbouring nations, including Algeria, Tunisia and Egypt, to contain the flows. Aid groups, however, accused the EU – whose leaders are under popular pressure to be seen to be controlling immigration – of abandoning humanitarian values and misrepresenting conditions in Libya, where the UN-backed government of Fayez Seraj has only a shaky and partial hold on the country. “Libya is not a safe place and blocking people in the country or returning them to Libya makes a mockery of the EU’s so-called fundamental values of human dignity and rule of law,” said Doctors Without Borders (known by its French initials, MSF), which works in camps there. “Sending children back to a country many have described as a living hell is not a solution,” said Ester Asin of British charity Save the Children, in advance of the approval of the widely trailed new EU strategy. Yves Pascouau, director of migration and mobility policies at the European Policy Centre, said that talk of “stemming” refugee flows and breaking the business models of people smugglers was futile. “We all know that if we really want to break this business model, we also need to provide legal ways to enter the EU, which [do not exist] today,” he said. The agreement on Friday came a day after Seraj signed a deal with Italy, which offered 200 million euros ($215 million) of its own. Rome fears new arrivals this spring, following a record influx of 181,000 migrants last year, would put pressure on services and risk a popular backlash – especially since its EU neighbours are no longer letting most migrants travel north out of Italy. Many EU governments are sceptical that the latest measures can have much effect on migration. One senior diplomat called it a “long shot”. Several said the declaration was intended partly to appease Italian demands that the EU be seen to be acting. In the longer run, analysts say European leaders are placing hopes in using their muscle in Africa to reduce incentives for people to leave, while giving African governments reasons to take back citizens who fail to win asylum in Europe. What Does Gaddafi’s Fall Mean For Africa?